6 Health Benefits of L-Lysine You did not know about! For all those who read the title and wondered what Lysine is in the first place, here is your answer! Lysine, also popularly known as L-Lysine, is an essential amino acid. It is useful for building many other crucial proteins. These proteins play an important role in building up immunity, increase digestion, and other such bodily functions. It increases absorption of calcium builds protein in the muscle, helps produce hormones, enzymes, and antibodies. 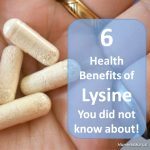 Therefore, today, I’d like to talk about 6 Health Benefits of Lysine you did not know about! Its deficiency is usually very subtle and the symptoms are not loudly pronounced. But many of the below mentioned symptoms, if exist together, it indicates that Lysine deficiency could be a probability. L-Lysine tends to promote natural, effective growth of children. Lysine, along with arginine is known to stimulate growth hormones that prevent stunted growth in children. If taken along with Vitamin C, it can phenomenally improve the heart health of an individual. In developing countries, diets are more grain-based, which means they are more lysine deficit. Anxiety and related reactions like diarrhea can be improved with the help of supplementation. We did discuss earlier that it helps builds various essential proteins, of which, one is Collagen. The collagen – calcium bond makes bones stronger and live longer. Collagen helps build cartilage and the connective tissues. If you come in contact with herpes-infected saliva, chances are that you’d get those cold sores or blisters around your lips too. Lysine helps with lowering chemicals that cause herpes and associated symptoms in the body. There are 3 simple ways to increase the consumption of Lysine by the body. The product is available on all leading websites and Chemists. If you liked reading this article, do SHARE it with your friends. You May also like to read Hypomagnesemia: all you need to know about Magnesium Deficiency. Zenith is no doubt a great brand for supplement, but I didn’t know about L-lysine and its health benefits. It indeed is one of the essential supplements. Thanks for sharing the knowledge. I am really fascinated by the range of supplements by zenith and the L-Lysin helps with so many benefits in one go. Nutritional supplements have become essential need of today’s fast life. Zenith is coming up with really nice range of products.